Jerry Dammers, Lynval Golding and Horace Panter formed The Automatics in 1977. When Terry Hall and Roddy Byers joined the band the following year, the band changed its name to The Special AKA The Coventry Automatics, and then to The Special AKA. The Specials began at the same time as Rock Against Racism which first gathered in 1978. 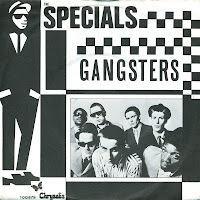 According to Jerry Dammers anti-racism was intrinsic to the formation of The Specials with an intention to integrate both black and white people. In 1979, Dammers decided to form his own record label, and 2 Tone Records was born. On this label, the band released their 7" debut 'Gangsters', featuring a part of Prince Buster's ska hit 'Al Capone'. The single peaked at number 6 in the UK singles chart. In the Netherlands, the single reached number 13.